As I’ve been pondering the miracle God gave me (read God Healed Me), I realized this is the beginning of a journey; not the end of a health issue. A few weeks ago, I wrote a post Come to Me, about finding out I had heart issues, and a possible blockage. This past Thursday I had a heart catheterization procedure to see if what the tests showed was true. Like me, I'm sure you all have had these conversations in various flavors...and that you've been both Sally and Bobby. Today I'm pondering the tension between faith to pray for the desires of my heart, and praising God that I don't yet have them - accepting and being thankful for things just as they are today, even if they never change. How am I supposed to be thankful for unanswered prayer? How do I balance between them? The Lord told me at the beginning of the year that my health was to be a priority this year. I thought, OK, I will start back to Crossfit (check) and eat better (semi-check). Still I had high cholesterol, and the results of a Coronary Artery Calcium Scan (CACS) showed buildup in my arteries. OK, my doctor had my attention, and I started taking cholesterol medication. In the first two parts (part one, part two), I shared about how our unity as believers is related to our saltiness. How the world sees Christians treating each other impacts how they see Jesus. How salty we are, and are becoming, is also directly related to how close we are to God, the Source of our salt. How close we are to God is related to how obedient we are to His commands. In part 1 (read here), I talked about how Jesus relates saltiness in believers to being at peace with each other. The purpose of our saltiness is to be salt (and light) to a world that needs Jesus. It’s not about us; it’s about us treating each other with love and respect so the world sees something different in us, and when they ask we can tell them about our Jesus. The question of how we remain salty begs another question: what (or Who) is the source of our saltiness? Our value? This 3-part blog post is addressed to Christians, followers of Jesus. As I read people’s Facebook posts and comments about the election, I was surprised and heartbroken at how Christians spoke out about and put down other Christians. I was also amazed at some of the viewpoints expressed in the posts. This morning as I prayed for friends and family, the words “good enough” came to mind, along with how people use those words in different ways as reasons for why they don’t have or need a relationship with Jesus. Today I woke up late, didn't have time to have a quiet time. Well, I did have part of one – I read a little in the Bible and I read my My Utmost for His Highest devotional. Then I called Don, packed up my stuff, and it was time to get ready for work. Daddy, I Broke It, Can You Fix It? Tuesday I found out I have heart disease. It's something I should have known, given my high cholesterol for the last few years. But I've been ignoring it. Trying to eat better. Trying to lose weight. Trying to exercise. This weekend I was so looking forward to seeing you and spending time with you and being romantic with you. I was all prepared for a wonderful greeting at the door when I arrived home for the first time in three weeks. I took extra time to “primp” so I’d look and smell really good. I anticipated and pictured your smile as you swept me into your arms and held me close. This morning I made the mistake of reading work email before my quiet time. Or so I thought it was a mistake. One email was a response to something I sent – a response that felt like the person said, “Oh yeah, you think you’re right, take THAT!” Paragraphs of information telling me why I am wrong and they are right. My initial response was defeat: I give up! Followed by, “Who do they think they are!” and labeling them as just plain evil. Followed by how I am learning all about evil by having to deal with them, and I am going to write a blog about their evil. I remembered all the “evil” they had done over the past several months of working with them. I so wanted to call them out on all their mistakes and wrong-doing! Angry, I wanted them to pay for what they did. But I knew that instead, I needed to forgive them and move on. I cried out to God for Scripture that would help, that would give me direction on what to do. 1 Peter 5:4 came to mind. I read the verses around it, too. And now, a word to you who are elders in the churches. I, too, am an elder and a witness to the sufferings of Christ. And I, too, will share in his glory when he is revealed to the whole world. As a fellow elder, I appeal to you: 2 Care for the flock that God has entrusted to you. Watch over it willingly, not grudgingly—not for what you will get out of it, but because you are eager to serve God. 3 Don’t lord it over the people assigned to your care, but lead them by your own good example. 4 And when the Great Shepherd appears, you will receive a crown of never-ending glory and honor. 8 Stay alert! Watch out for your great enemy, the devil. He prowls around like a roaring lion, looking for someone to devour. 9 Stand firm against him, and be strong in your faith. Remember that your family of believers all over the world is going through the same kind of suffering you are. Exactly the passage I needed – God knows me SO well! In fact, in my time with Him this morning, He already has. Reading His word changed my focus from the problem to the Problem Solver; from the world’s ways to God’s ways. While I was upset that I even read that email because it disrupted my “quiet time”, God knew I needed to read it now so He could give me perspective before I got to work. He also knew I needed to spend this time with Him before responding to anyone – I tried to send an email to someone about it, and the email application logged me out. It has never done that before. God reset my heart and attitude; He restored my peace and joy. He also restored my perspective: not ALL they did was bad - they've also done good and right things. I am reminded of another verse from Romans 12:21. Jesus, you are amazing! Thank you for Your faithfulness to give me exactly what I needed this morning when I asked for help. Thank you for leading me in Your way and restoring my soul. I choose to forgive; give me Your eyes and your heart for all the people involved. 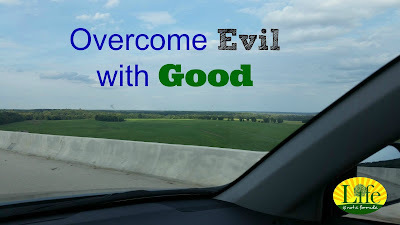 Help me to overcome evil with good. Yesterday I slid into a telephone pole and a mailbox. Thankfully the cross-street was clear when I slid across it, and thankfully I was only going 5 mph or so. My nephew was with me, and he helped pull the fender out, fix the headlight (temporarily), and duct tape the left side mirror. An open, unplanned day is like a blank slate – where do I start drawing? I look around my house at all I have to do and my messy desk with all the paperwork. It’s overwhelming to know what to do first when everything seems so important. I love it how a story I’ve read in the Bible many times speaks to me in a way I need it right now. Yesterday morning it was the story of Joseph’s journey through prison in Genesis 39 – 41 (verses are from New Living Translation).